One field trip this year will be to Maine Coast, LLC. Maine Coast is a seafood distributor specializing in lobster. Their 16,000 square foot facility holds 150,000 pounds of live lobster. 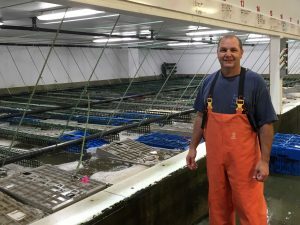 Take a tour and speak with their facility managers and operations personnel about the way they run their large lobster holding tanks and their processing, packaging, and international shipping facility located there in York, Maine. Photo credit: Maine Coast, LLC, used with permission, all rights reserved. About a 15 min walk from the York Harbor Inn is the Wiggly Bridge that leads to Steedman Woods. If we get lucky we will be able to see some of the earliest blooming spring ephemerals (think violets, trillium, trout lily, jack in the pulpit, etc). Might be a nice way to stretch our legs, clear our head with some forest bathing, and enjoy some of this beautiful spring. Bri is a fervent wildflower lover and botanist and is delighted to lead this excursion. Bri worked as an environmental educator for Camp Ketcha in Scarborough, Maine doing this type of work with children and currently works at Great Bay NERR helping to lead vegetation surveys. So, plants are definitely some of her favorite things! Photo credit: Wiggly Bridge Panorama by Andy Gregorowicz, link, (CC BY-SA 2.0).